Which is faster for a member, doing Icewing with a full party or just farming the general? I won't talk about the mobs because honestly even farming the level 95 guys before Icewing felt like it was more or less the same exp as the general. 1. What's the best way to grind Glacera rep while Frostval is still here? 3. Best way to reach 80? 1. Either "Thin the Horde(Farming Quest)" at Icepike which is unlocked after finishing the quests there, the Chained Kezeroth Boss quest (if you can find a group to kill him quickly), or the quest where you kill 5 Frozen Moglins. The latter option is mostly just if you are lazy and/or lower leveled, the prior 2 options should get you to rank 10 quicker. 2. The Shogun Paragon Pet returns every year for Dage's Birthday, costs 2k LTs instead of 2k ACs and is one of the best Paragon Pets you can get. Just stack up at least 2k LTs for March, then get the Shogun Paragon Pet and your LT gains will increase tremendously. This one also returns every year for ACs, but it should be a little slower than Shogun paragon if I remember correctly, plus you save the 2k ACs by getting Shogun instead of that one. Shogun Paragon also returns for ACs, apparently, but I still find it a waste if you can just farm up 2k LTs anyways, which with Dreadrock isn't that hard of a task, especially when you have several months to prepare. ill try to max out Glacera while the boost lingers. I’m currently attempting to farm for Void Highlord. I already bought the two Void Crystals, so I just need to finish the Highlord Challenge Quest 15 times, now. What is the quickest way to earn gold? I'm partial to the Vorpal Bunny myself, though that's not affected by a gold boost and is most effective if you actually own it yourself. If you're going for the Roents, though, worry about the gold last. You'll probably get most, if not all, of the gold you need for a turn-in just in the process of farming all the other stuff. You can also take a look at the Gold section of the farming guide to see if any of the methods there tickle your fancy. What in the world. 2 uni 13s, 90 bloodgems, tainted gem, non-mem voucher, and some random (maybe 1% drop) from Aisha's drake. Does Asuka even know what it means to farm blood gems? Even with a powerful farming pet blood gems aren't easy to get! Great. Wonderful. So after all our complaints of "too much RNG" from Nulgath quests, those were cut and instead well . . .
EDIT: Oh wait there's another alternative but it requires 1 uni 13, 75 tainted gems, 75 diamonds of nulgath, 1 member voucher, 100 gems of nulgath, 1000 approvals, and the aisha's drake drop. The 2nd quest has an extra cape so I guess that's more worth doing? Oh I didn't notice that. That's... actually shocking, 450 Blood Gems for the entire set(550 if you count ENNH itself, which I don't cuz I've had it for years) is ridiculous and I know I will farm it all, but I think trying to do this one without a farming pet goes with non-SDKA NSoD for "Things only someone clinically insane would do". I really don't want to spend all my hard earned reagents for one item but this is getting pretty tempting to look at . . . I would like to make it clear that I had nothing to do with designing the quest! Yea that's mostly where my complaints go. I also do not like the idea of putting a non quest pet behind a 90 Bloodgem requirement. VNM is fairly easy to farm assuming youre not directly farming for it since you wont be frustrated. But bloodgems? Youre going to be directly farming it and you will be frustrated. I only wish that the Winter Diamond would stack to 10(as many as you can possibly need), right now it only stacks to 2, because it feels more like a hassle than anything difficult, if I had to make a wild guess, I would say it is a 25%-ish drop, so it's not so low as to make, so it's not so low as to consider it part of the grind, but it also means I have to break my farming momentum every time to go out of my way to get the Diamonds. ENNH aside, I want to know if an ENNH mechanic is available for Legion Castle. We all know that we can access the quests from other people's house assuming we own ENNH. Is this true for Legion Castle? Asuka tweeted something about adding things to Legion Castle so now I guess I have a reason to farm it but I'm still thinking about it. I decided to ask Asuka about this on twitter, and you can check his response yourself, so if this does happen, which is still a huge if, merely owning the Castle will be enough. I could get the Castle on a moment's notice myself, since I already did the dailies for the 15 Shadow Shrouds eons ago(thank heavens those things are AC-tagged), and I have a full stack of LTs ready in my bank, I actually just might, once I am done with Void Warlock(currently at 2/5 Tools For the Job and 3/5 Corrupt Touch), so I will have time to re-farm my LTs. I basically only farmed Blood Gems so far, I realized that outside of Tainted Gems, the two quests synergize well together if you are doing Drone/CVKS/any other farming pet, you get Gems and Diamonds back while farming Blood Gems, trade in Essence of Nulgath for more Gems, get Essence of Nulgath back while farming Makai Fangs for Drone, and so on, the only thing I know will get in my way is the Tainted Gems, but Drone still gives you a chunk of the Tainted Gem back, and I had a full stack of Bone Dust explicitly to be able to get Tainted Gems on a moment's notice, so I haven't needed to farm Tainted Gems yet, the only think that slightly breaks my momentum is the need to farm Approvals for every Corrupt Touch turn in, but that's relatively minor. My only complaint about it is that Corrupt Touch also takes Tainted Gems, I would much prefer if it took Dark Crystal Shards instead, since Drone would also return the DCS spent, but otherwise, splitting the set into two quests instead of making us farm 900 Blood Gems for the entire set made the entire thing much easier, and Blood Gems are the only real concern as a result. So, I went ahead and bought Crag and Bamboozle since they are non-member now. The Diamond Exchange Quest sure is convenient. It is also great that /evilmarsh is still around for easy access to the Tainted Elemental. 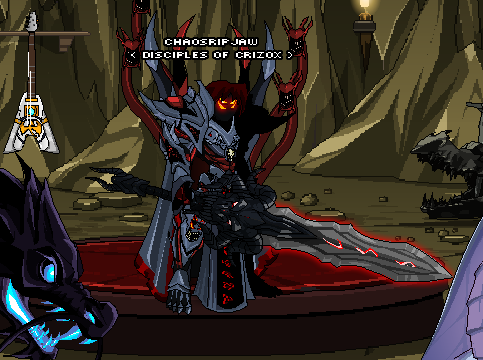 Now, What is the quickest way to farming for Gems of Nulgath? Is it the Poisonous/Refreshing Deal Quest from Bamboozle or the Voucher Item: Totem of Nulgath Quest from Drudgen? I’m not a beta player, so the undead plague spear is a pain to get; I believe that the drop rate is very low for Big Jack Sprat. I also tried to see if there was a way to convert my Dual Undead Plague Spear in Nostolgia Quest, but it seems that the wiki needs to be updated since I can’t find the Undead Plague Spear in Yuglar’s Dual Reversal Shop.